This year's Honors Institute was in conjunction with the Office of the President and addressed "Democracy, Politics and You". Dan Rather was the keynote speaker for the 2017 Honors Institute. It was held on Tuesday, January 31, at 7:00 p.m. in the Wright State University Nutter Center. The annual keynote address, in collaboration with the Wright State University Presidential Lecture Series, is free and open to the public, and tickets are not required. 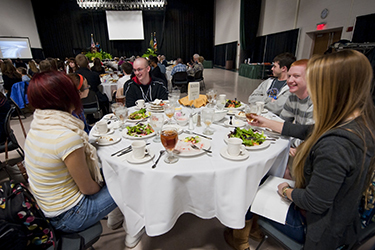 The 2017 Honors Institute Luncheon was held on Wednesday, February 1, 2017 in the Wright State University Student Union Apollo Room and featured John Herrman, David Carr Fellow from The New York Times.